This week’s (Nov 29-Dec 5/13) is… Forrest Gump! I remember when I was a pre-teen and first hearing the name Tom Hanks. He was in a new TV show called Bosom Buddies. I hadn’t seen any episodes, but I’d heard over and over how funny it was. It would be two years after that show was cancelled that I saw my first Tom Hanks movie–Splash. My friends, siblings and I absolutely loved it. I was too young to understand the difference a skilled actor or actress would have on a movie or TV show, so I just thought I liked it for the story and, of course, the funny parts. Hanks really knew how to do funny. I discovered that years later watching The Money Pit, Dragnet, Big, A League of their Own, and my personal favourite of his comedies, The ‘Burbs. By now, Hanks was in the class of actors where people would say, “Oh, it’s a so-and-so movie? I want to see that!” It wasn’t until I watched Philadelphia that I realized how much of a powerhouse actor he really was. It seems everyone else did too, because after that movie, he not only starred in this week’s MOTW, he also went on to star in some of the most memorable movies like Apollo 13, Saving Private Ryan, and Captain Phillips. To me, Tom Hanks was like a favourite uncle. He had the lines he’d deliver that you would laugh later about with your siblings and you knew most of the reason for your belly laughing was his delivery than his actual joke. He also had the voice of an experienced, wise man who could really make a statement mean something. Now I have to admit that I can relate to my friend Josh and his misgivings about Forrest Gump. I love this movie and it’s one I can watch multiple times, but pop culture has over-quoted it to the point of eye-rolling irritation. The same has happened with one of my favourite movies, Jerry Maguire. For me, the final scene is powerful and one of the few romantic scenes that I find is done right and believable. However, hearing “You complete me,” and “You had me at hello,” with exaggerated sappiness for a laugh, and hearing that just as often as bald jokes (Hey, I’m not angry about it… it’s just true. They’re overdone. I will never speak of this again. ), it does wear on you. In 1994 when someone was running down the hall at school and someone yelled, “Run Forrest, run!” everyone laughed and slapped that kid on the back. Today, they get either a cold shoulder or a punch to the shoulder and the terrible feeling of being lame. However, that being said, Forrest Gump was, and still is, a unique movie compared to any other. It’s all about one man, and we all feel for him. We all have a part of him inside of us and could relate to the one time he gets emotional in the movie (SPOILER ALERT) : when he asks if his son is smart. And it doesn’t only mean something to those who have children. I didn’t at the time that I watched the movie and that moment struck a chord in me. We all have a little part of us that feels inadequate and not measuring up to the rest. When someone who appears slower or more challenged than everybody else seems to not let that bother them and they beat the odds, it inspires us. And when that person feels the pangs of low self-worth, we’re there feeling the same pain. And perhaps what brings that emotion out is when something we have made or done is either celebrated or run down. Congratulations Forrest Gump. This is your week. Best actress: Robin Wright definitely deserves this one, though I hope she doesn’t find out–she has virtually no competition. You don’t see too many women in men’s prisons and not as many were on the front lines in wars as there are now. I’m counting on it that she won’t find out about this. Best actor: We definitely need to pick someone other than Hanks for this, and this week it goes to Gary Sinise. I remember when the movie Ransom came out. It starred Mel Gibson and Rene Russo, but Joy and I were wanting to see it mostly because of Sinise. 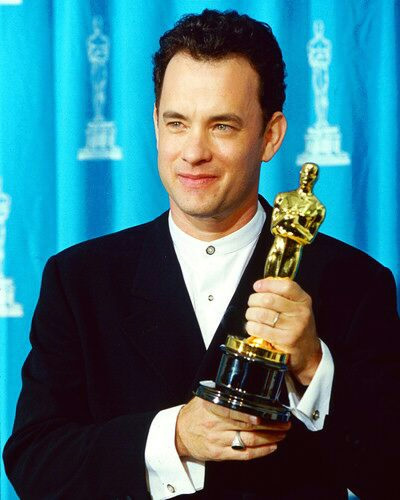 1) The fact that he was the first actor since Spencer Tracey to win back to back Oscars for Best Actor. 2) The pictures he took with a fan who pretended to be drunk. According to Snopes, he’s not really drunk as the story has been spun since. 3) His guest appearances on SNL. Even considering Christopher Walken, Steve Martin and Father Guido Sarducci, I think the episodes with him are the best. And this week’s (Nov 22-28/13) is… Amélie! Early in the movie Amelie says that she likes to notice the details that no one else does. This came across to me as a kind of theme that represents the show and its story as a whole. From beginning to end almost every shot is one that could possibly be a work of art all its own hanging on a wall somewhere in Europe. We don’t just learn the basics of peripheral characters, we learn what they like (such as popping bubble wrap or cracking crême brulee with a spoon) and what they detest (such as clinging wet swimming trunks and the phrase “fruit of thy womb”). It’s the kind of movie you could watch and enjoy even if it had a boring plot and uninteresting characters. But it has neither. You sometimes find yourself saying, “Why is that important?” or “What was that all about?” But what it’s all about it up to you. The details are plentiful, just like in a painting. Just like life. Sit back and enjoy it. Speaking of art, I often tell people that I think movies are art just as much as paintings, sculptures, etc., and sometimes the reaction I get is similar to what I might get if I said professional wrestling is a sport. If ever I had to try and prove this point, this is exactly the movie I’d choose. Each scene, each character, each set, each dialogue is artistic. It’s even in French for Pete’s sake. As you may have noticed by now, I hate giving out too much information on the details of a movie. But I can say that following Amélie around, discovering what makes her tick, and listening to the story that unfolds is something that should not be missed. And, yes, it is whimsical Josh and Dave. In my mind this is also one of the few movies to “get it right” when it comes to romance in the movies. I’ve never been one to appreciate or enjoy romance movies, but there are a few exceptions, and at the top of the list is Amélie. Congratulations Amélie, this is your week. Best actress: I agree with those who suggested Audrey Tautou. She was so perfect for the role of Amélie you would swear they came up with the idea of the movie after meeting her. Best actor: I’ve said it before and I’ll say it again. Peter O’Toole is friggin’ weird in Lawrence of Arabia. Knowing that both Russell Crowe and Joaquin Phoenix get crapped on a lot, I am going to stick my neck out and give both of them a nod, with Crowe winning in the end. They both really are great actors. When I watched Gladiator for the first time, I knew I had seen something great. I had never known the name Russell Crowe up to that point and loved his performance. Best quote: “Are you not entertained? Is this not why you are here?” You tell ‘em Maximus Decimus Meridius! I didn’t talk at all about District 9, which is crazy seeing as it’s one of my favourite alien/sci-fi movies ever. It will likely pop up again later on a sci-fi -based theme. And if you’re wondering what to get me for Christmas, don’t get me this one. Nor Amélie. I have them. Feel free to get me Gladiator, The Usual Suspects, The Good, the Bad and the Ugly or any of the LOTR movies. Movie tickets are fine too, but don’t over do it. A new segment …and you can win popcorn! It is time for the first installment of “Popcorn Pop Quiz.” You simply have to be the first person to answer the question right by replying to this post. If you do, I will send you popcorn in the mail. It will be the real stuff too. None of that microwave garbage that tastes like butter-flavoured packaging foam. What do these four movies have in common? 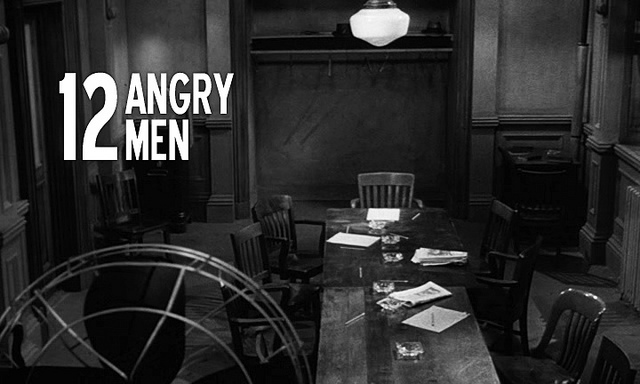 This week’s (Nov 15-21/13) movie of the week is… 12 Angry Men! There is no other movie that has surprised me the most in my quest to watch as many of the the IMDb’s top 250 than 12 Angry Men. For starters, I was surprised that there was a movie in the top 10 of which I knew absolutely nothing. I decided to watch it one night while the kids were in bed and my wife was out earning money, hopefully to by me movies or movie tickets for Christmas. It seems to me that at this point I had heard the dreaded detail of this film: most of it takes place in one room with the same twelve characters. And they’re just… talking. So yeah, my hopes weren’t high. You guessed it. I was wrong. Despite what sounds like boredom comparable to an insurance seminar would be to a 6-year-old, this movie had me hanging on every word. Not much action? None. No love interest? Nope. But if a story is told the right way it doesn’t matter what elements you may or may not have. Henry Fonda and Jack Klugman (aka Dr. Quincy and Oscar from The Odd Couple) were the only names I knew, but every actor gave a great performance. Seeing the cast list on IMDb you might think character development could be an issue. None of them are given names! All you see listed is “Juror #1, Juror #2, etc.” (Though I seem to recall that a couple of them do share names with each other.) But character development is one of the things that this movie does so well. In such a short amount of time we learn so much about these men–who they are (To know that, who needs a name, really?) and what makes them tick. 12 Angry Men, like To Kill A Mockingbird, does a great job teaching the timeless–though too often ignored–lesson of not drawing conclusions too quickly nor based on established prejudices that seem to dwell in all of our minds. Both movies also do an excellent job of emphasizing the importance of questioning. Questioning the circumstances. Questioning the proof. The people involved and the stakes they hold. And most importantly, questioning one’s own intentions, agendas, and ways of thinking. This is something we don’t do enough as human beings, yet when we do our lives improve dramatically. I feel like I should be saying more about 12 Angry Men, but it’s one of those movies where the less you know the better. And it’s easy to find–the entire movie is on Youtube: http://www.youtube.com/watch?v=RelOJfFIyp8. Congratulations 12 Angry Men. This is your week. I’ve gotten away from writing about any of the other nominees each week, so let me just take a moment and sing the praises of both of the other candidates for this coming week. The Bridge on the River Kwai was as epic as a movie could be in 1957. That year it beat out both 12 Angry Men, a movie that is still celebrated, talked about, even studied today, and Witness for the Prosecution, another stellar movie that hits #95 on the IMDb list. It is long, and it is military themed, so it doesn’t cause line-ups at HMV, but it’s definitely worth seeing. Some Like It Hot? Honestly I wasn’t all that crazy about this one. It was great to see such a huge pop culture icon in Marilyn Monroe in her element. She was great in this, and so was Tony Curtis. But I have to admit that Jack Lemon kind of ruined it for me. I’m sure it was considered hilarious in 1959, but there were few scenes where I laughed at all, and I found Lemon to be quite the over-actor. I admit, however, that when it comes to comedy, I find it harder to appreciate the art as I do with other genres. Nacho Libre and Dumb and Dumber keep me laughing too much for me to take the old ones seriously. I felt the same way about It’s a Mad Mad Mad Mad World. Best actress: Who else? Marilyn Monroe! Best actor: Obi Wan Kenobi in The Bridge on the River Kwai. I never thought I’d enjoy movies from the 1950’s, but I really do. Going through the top 250 list is proving to be a more than rich experience. If you ever see any of these movies, give me a call and we can chat over some coffee. Your treat.